Welcome to The Petey Post. At Hail Varsity, we were looking for a way to get my writing in front of you all in a package that was unique and could be expected at the same time every week. Think of writer/editor extraordinaire Brandon Vogel’s daily “Hot Reads” post, except different content and probably not as cool. This is also going to be a way for me to channel my voice, sarcastic quips and dad jokes into an acceptable medium, so they’re not leaking into the practice reports I know you all love. To get things kicked off, I wanted to do something slightly off the wall. I’ve spent the last two years entrenched in Oklahoma football. Over that time, the Sooners have been a mainstay in the College Football Playoff discussion, making a semifinal in 2015 and winning the Big 12 and being right in the thick of things at the end of 2016. This upcoming season will be no different. Nebraska wants to get to where Oklahoma currently is. The Huskers haven’t won a national title since 1997, and they have yet to win a conference title in their new home. The philosophies are different, but the tradition and brand names are incredibly similar. Both programs are rooted in winning. In this first iteration of the Petey Post, I’m going to rehash what I’ve seen during the first two weeks of Nebraska’s fall camp compared to what I’ve seen at Oklahoma. Last season Oklahoma had a Heisman shot-caller, a backfield baller and a home run target (I know, I tried real hard to find a third thing ending in “-er”). 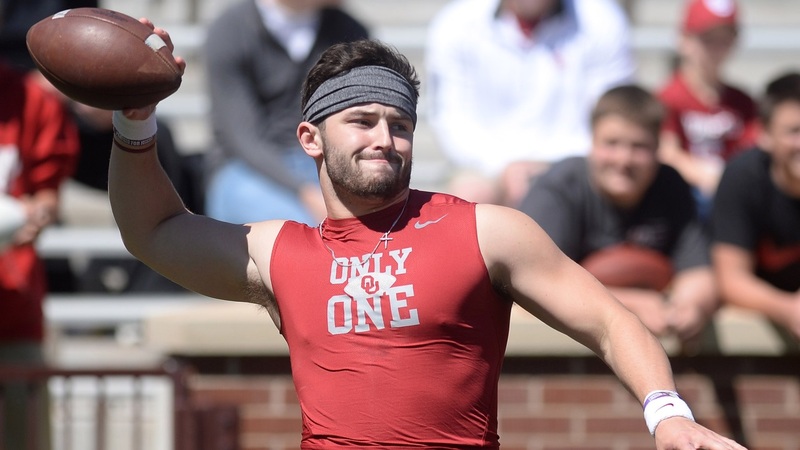 Quarterback Baker Mayfield, running back Samaje Perine and wide receiver Dede Westbrook were the pistons that drove the Oklahoma engine. Regardless of who had the ball, you could expect some magic. From what I’ve seen so far, Nebraska has, for sure, one-third of its Big 3 in quarterback Tanner Lee. Let me get out in front of this with a disclaimer: Lee isn’t a Heisman contender. He’s not Mayfield. But in this scheme, with the talent and the arm that I’ve seen so far, I’m starting to come around on Steve Calhoun’s 2017 projections. Lee is the kind of guy that can lead a top-flight offense if everything falls into place. And yes, I’m talking about the offensive line. But we’ll get to them in a second. If you noticed the “for sure” above, you’re probably wondering why I felt the need qualify that. Well, it’s because they might have another third in wideout Stanley Morgan Jr.
Morgan has looked impressive to me. At 6-foot-1, 195 pounds, the New Orleans native looks the part of a double-team commanding, 1,000-yard receiving college wide receiver. With Lee throwing him the ball, and another legitimate threat opposite him in senior De’Mornay Pierson-El, I’m expecting a breakout season from Morgan. Obviously, Morgan’s success is more reliant on Lee’s success, which is reliant on the offensive line’s success, thus the hesitation to definitively say one way or the other. But, no one saw Westbrook becoming a Heisman finalist last season and what Morgan lacks in speed compared to the self-proclaimed McDonald’s lover, he more than makes up for in strength and an ability to make plays after the catch (something that could be huge in an offense that emphasizes a “hit quick and get out of the way” mentality). The problem lies at running back. Nebraska doesn’t have a Samaje Perine. At least, not from what I’ve seen. Juniors Devine Ozigbo and Mikale Wilbon are both physically built backs, but neither has been a bell cow. What’s more disheartening? That none of the top four backs have created any kind of separation from each other through two weeks of fall camp. Oklahoma had a one-two punch in the backfield as good as any in the country last season. Nebraska doesn’t have that luxury. Good teams have two of the three necessary pieces of a Big 3, great teams have the full set. Looking at the future, though, is a positive sign. Freshman receiver Tyjon Lindsey could be a star in the making, and freshman tailback Jaylin Bradley has drawn rave reviews from his coaching staff. Add to that the incoming Joshua Moore and potential return of Keyshawn Johnson Jr., and you have the makings of an exciting set of skill players. This is easily the most noticeable difference. Oklahoma has one of the best offensive lines in the country, if not the best. It’s a line fortified by a 6-foot-8, 345-pound second team All-American left tackle in Orlando Brown. Add in a 6-foot-4, 312-pound Bobby Evans at the opposite tackle spot – who gave up two sacks in over 600 snaps as a redshirt freshman last year – two monster juniors at the guard spots and a center on the Rimington Trophy watch list, and you’re feeling pretty good as a running back or a quarterback. Oklahoma also boasts veteran players with legit experience as backups. Nebraska doesn’t really have any of that right now. Junior tackle Nick Gates is the star of the bunch. At 6-foot-5, 295-pounds, he fits the “big ugly” category and has the experience to boot (probably why he was named to the Outland Trophy watch list for this season). But there are questions all around the man with the cool hair. Guard Jerald Foster looks solid, but missed most of last season with an injury and he’s a little undersized. Junior Cole Conrad spent time at right tackle last season but has moved over to center during spring ball. David Knevel, who should be Nebraska’s best option as a 6-foot-9, 315-pound senior, is being challenged by the coaching staff to step up. Tanner Farmer, an established starter last season, is losing first team reps in camp to redshirt freshman Boe Wilson. Jalin Barnett, a highly-touted guard in the 2015 class just hasn’t lived up to the hype and looks to be buried on the depth chart. Questions on questions on questions. That’s the best way to describe the Nebraska offensive line. Oklahoma is the exact opposite. If Nebraska had Oklahoma’s linemen up front, we’d be talking about this upcoming season a lot differently. Let’s go in another direction for a minute, because it’s not all doom and gloom. If Oklahoma had some of the Huskers’ secondary talent, it might have made the College Football Playoff last season. Maybe Oklahoma doesn’t beat Ohio State, but the back end of the defense wouldn’t have gotten run over by the Buckeyes and Houston before them. I love safety Joshua Kalu. From the film I’ve watched from last season, what I’ve seen in fall camp and what I’ve heard from Kalu’s defensive coaches, there’s a ton to like about the 6-foot-1 senior from Houston, Texas. Defensive coordinator Bob Diaco believes Kalu can be one of the best safeties in the country and there’s not a whole lot of reason to argue that. Oklahoma doesn’t have a guy like that. Senior corner Chris Jones is another guy I look at in the secondary as being someone the Sooners just don’t have a replica for. Maybe senior corner Jordan Thomas comes close, but Jones’ physicality sets him apart. Sprinkle in a little bit of senior Kieron Williams and a dash of junior Aaron Williams, and the talent found in Nebraska’s secondary wins out. I know Jones is injured, but that’s not really what we’re talking about here. I also know it might be a little difficult to contrast the two units for a couple reasons. First, the schemes are slightly different and there’s different emphasis placed on different positions. The safeties are the “quarterbacks” in Diaco’s 3-4 defense. That’s not the case in defensive coordinator Mike Stoops’ Oklahoma group. Second, Nebraska has to contend with a different style of offense than Oklahoma does in the Big 12. I get all that, but here’s the deal, Oklahoma’s secondary was bad last season. The Sooners ranked No. 117 out of 128 FBS schools last year in passing yards against. (The Huskers were No. 37 if you care about that sort of thing.) I just don’t see the same talent deficiencies in this Husker unit I did with the Sooners.